This is part 3 in our series on creating a killer mobile app. And, in case you missed, here’s part 1 and part 2. The core loop is the single most important part of a mobile game. A set of actions that determine how the game flows, it’s the beating heart of what makes a game fun. 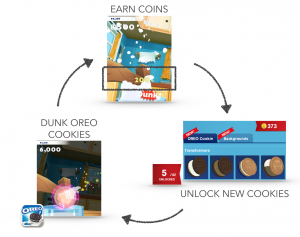 In Oreo’s chart-topping mobile game, OREO: Twist, Lick, Dunk, for example, the core loop is: dunk Oreo cookies > earn coins > spend coins to buy virtual cookies (and repeat). If you’ve ever played a game, you likely notice that Oreo’s loop isn’t unique – its logic is similar to most other games and even applies outside of games. 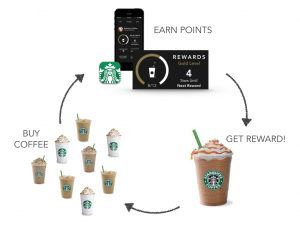 Online or offline loyalty programs, such as coffee cards, work using the same reward logic: buy coffee > collect stamps > get free coffee. 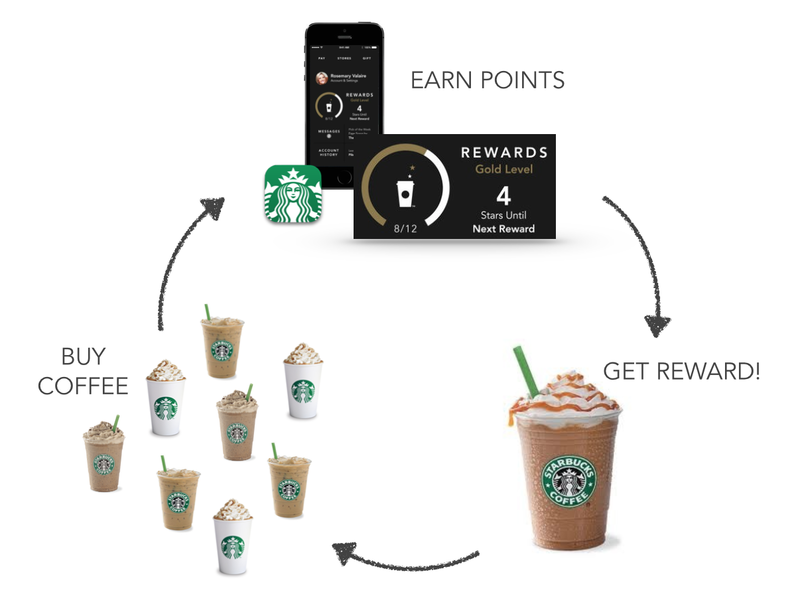 The Starbucks app is a prime example. The core loop can be generalized: do something > build rewards for that action > redeem reward. No loop. The point of a core loop is to keep a user engaged while showing progress. Too many apps don’t give users a reason to return after one or two sessions. Virtual-reality photo booths often fall victim to this – users download and use it once but have no reason to do so again. No happy ending. All core loops peak with a pleasurable experience. We take a specific action and earn a reward. The rush of dopamine brings us joy and inspires us to start again. If the reward isn’t good enough, or comes too infrequently, we’ll quickly tire of the app, and not return. No evidence of progress. You never doubt how you’re doing with your coffee card – a quick glance tells you how close you are to your next free cup o’ joe. Great mobile apps use clear visual language to display progress. A game, for example, might keep the number of coins earned on the main screen, prompting players to continue earning. OREO: Twist, Lick, Dunk flaunts a cookie book that entices players to keep playing to unlock each type. Learn more about why Oreo’s app succeeds here. Great apps are built around an enjoyable, repetitive action, where effort triggers a reward and a new challenge. If I don’t get a reward, don’t feel like I’m making progress, or have nothing to do once I finish, then I won’t be returning to your app. To build apps that create an owned marketing channel and an ongoing relationship with consumers, brands need to steal a page from the gaming playbook and pay attention to the core loop of their apps. Have questions or unsure how to incorporate a core loop in your app? Contact us!